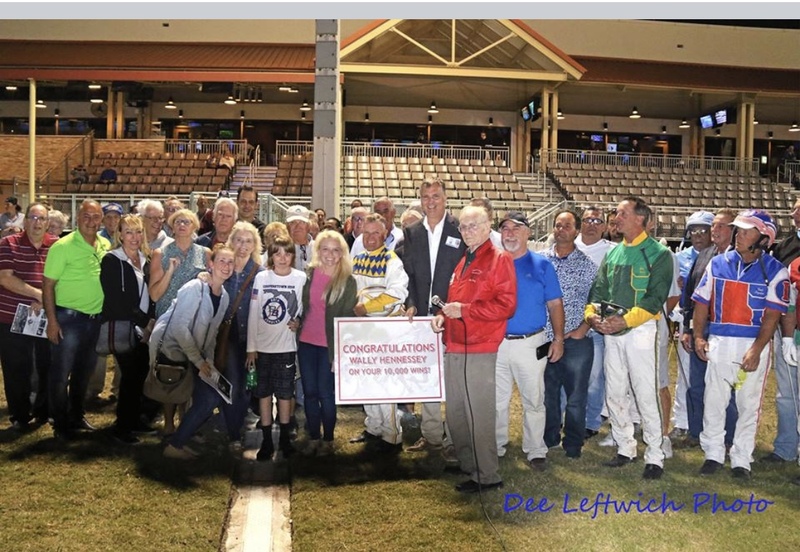 Hall of Fame driver Wally Hennessey achieved a milestone that only 16 other harness racing drivers have accomplished when he drove Prince of Fame to victory in the last race at Pompano Park on Wednesday night, January 23–his 10,000th career victory. Hennessey, who is sporting a lofty “batting average” over .550 during the current Pompano Park meeting, is averaging three plus wins per racing night and shows no signs of slowing down while competing against a very talented driving colony in South Florida. Last season, for example, Hennessey racked up 382 wins, second only to his 1995 total of 419 victories. Hennessey fondly remembers the early days on Eustis Street in Charlottetown becoming enamored with the sport that has been his life work. Hennessey has won some of the sport’s most prestigious races, including the Woodrow Wilson at The Meadowlands and countless stakes events here and overseas. When asked about his future goals, Hennessey remarked, “This is a sport that is a one-step-at-a-time sport. Having said that, my next goal is win number 10,001. Then, hopefully, I’ll go on from there. Hennessey has enriched the owners of horses he has driven by over $66 million and joins Dave Palone, Tony Morgan, Herve Filion, Cat Manzi, David Miller, Dave Magee, Billy Parker, Walter Case, jr., Aaron Merriman, Tim Tetrick, John Campbell, Mike Lachance, Kevin Wallis, Peter Wrenn George Brennan and Brian Sears in the exclusive 10,000 win club.